Unsure what to do when new hires don’t live up to your expectations? In today’s episode, we’ll discuss some practical steps for managing those expectations. Get a 13 Week Trial Subscription Here. Like this video and want to know more about The Leaders Journal? The Leaders Journal is a fast, focused, practical weekly video post for those who desire to lead with excellence. Each week, you’ll receive an email announcing the latest episode of the Leaders Journal. Each episode is no more than 3 to 5 minutes long — then you’re back to work, the soccer game or wherever you need to be. Each episode is focused on a specific problem issue or key leadership component — with to-the-point guidance. And each episode presents a practical call-to-action or challenge to put into practice the week’s lesson. Sign Up Now and Get 13 Weeks On Us! Fast-track your preparation for a leadership position. Hit the ground running when the opportunity comes calling. Avoid the frustration and headaches of unintentional, but all too common, leadership blunders. Are you looking to prevent costly mistakes by leaders who should have known better but never got the training? Do you want a quality pool of talent ready to step into leadership roles? Wouldn’t you like to train your people without disrupting business operations? Are you looking to create a consistent leadership culture throughout your group? Make a leadership impact immediately. Learn the nuances of leadership not covered in most training courses. Avoid lost productivity, time and money from “preventable” mistakes. Reinforce and extend leadership growth every week. Get in-depth leadership training without disrupting business operations. 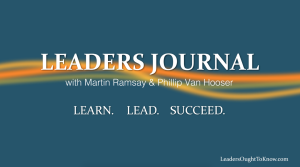 Get your 13 week trial subscription to The Leaders Journal now. Sign Up Here — It’s Quick and Easy! And if you want to share The Leaders Journal with your whole team…it’s easy as 1, 2, 3, 4.